Thank you for dropping in! If you need help lowering your blood sugar level, check out my books at Amazon or Smashwords. If you’re outside of the U.S., Smashwords may be the best source. Physicians focus so much on disease that we sometimes lose sight of what’s healthy and normal. For instance, the American Diabetes Association defines “tight” control of diabetes to include sugar levels as high as 179 mg/dl (9.9 mmol/l) when measured two hours after a meal. In contrast, young adults without diabetes two hours after a meal are usually in the range of 90 to 110 mg/dl (5.0–6.1 mmol/l). The following numbers refer to average blood sugar (glucose) levels in venous plasma, as measured in a lab. Portable home glucose meters measure sugar in capillary whole blood. Many, but not all, meters in 2011 are calibrated to compare directly to venous plasma levels. Blood sugars tend to be a bit lower in pregnant women. 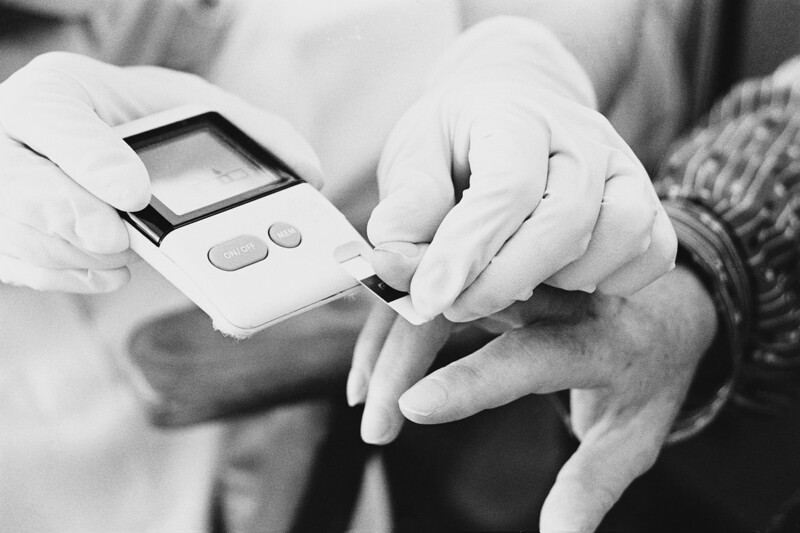 What Level of Blood Sugar Defines Diabetes and Prediabetes? If there’s any doubt about the diagnosis, testing should be repeated on a subsequent day. Compared to impaired fasting glucose, impaired glucose tolerance may be a better predictor of cardiovascular disease and death. So some researchers and clinicians focus on preventing high blood sugar swings after meals. The problem with prediabetes, which causes no symptoms early on, is that one of every four cases progresses to full-blown diabetes over the next 3–5 years. The numbers above do not apply to pregnant women. Five percent of pregant women develop gestational diabetes that goes away soon after delivery. What Level of Hemoglobin A1c Defines Diabetes? Another way to consider normal and abnormal blood sugar levels is to look at a blood test called hemoglobin A1c, which is an indicator of average blood sugar readings over the prior three months. The average healthy non-diabetic adult hemoglobin A1c is 5% and translates into an average blood sugar of 100 mg/dl (5.6 mmol/l). This will vary a bit from lab to lab. Most healthy non-diabetics would be under 5.7%. In December, 2009, the American Diabetes Association established a hemoglobin A1c criterion for the diagnosis of diabetes: 6.5% or higher. Diagnosis of prediabetes involves hemoglobin A1c in the range of 5.7 to 6.4%. The aforementioned blood sugar criteria can also be used. What Are Blood Sugar Goals During Treatment For Diabetes? 3) hemoglobin A1c under 7%. A hemoglobin A1c of 7% is equivalent to average blood sugar levels of 160 mg/dl (8.9 mmol/l). Hemogobin A1c of 6% equals, roughly, average blood sugar levels of 130 mg/dl (7.2 mmol/l). But remember, healthy non-diabetics spend most of their day under 100 mg/dl (5.6 mmol/l) and have hemoglobin A1c’s around 5%. Diabetic experts actively debate how tightly we should control blood sugar levels. For instance, Dr. Richard K. Bernstein—a type 1 diabetic himself—recommends keeping blood sugar levels under 90 mg/dl (5.0 mmol/l) almost all the time. If it exceeds 95 mg/dl (5.3 mmol/l) after a meal, then a change in medication or meal is in order, he says. Here’s the over-simplified “tight control” debate. On one hand, tight control helps prevent and may reverse some of the devastating consequences of diabetes. On the other hand, tight control in diabetics on insulin and certain other diabetic medications may raise the risk of life-threatening hypoglycemia and may shorten lifespan in other ways. Ideally, normal glucose levels before and after meals, with normal hemoglobin A1c. Treatment options for those not at goal include diet modification, weight loss, exercise, and medications. Admittedly, those goals are not acceptable or achievable by everyone with diabetes. Future studies may prove that such strict goals are not necessary to avoid the complications and premature death suffered by people with diabetes. Tight control may be less important for elderly diabetics over 65–70 years of age. But for now, if I were a young or middle-aged diabetic I’d shoot for the goals above. The gold standard for measuring glucose is a large chemistry analyzer in a lab, which measures values in plasma obtained from a vein with a needle. The glucose level in capillary whole blood, obtained via fingerprick and analyzed on a portable/home glucose monitor, is a different value, often 5–10 mg/dl (0.3–0.6 mmol/l) higher than venous glucose. As of 2011, a majority of home glucose monitors, but not all, are calibrated so as to be directly comparable to venous plasma glucose readings. Read your monitor’s paperwork to find out about your device. Portable fingerstick glucose meters are not as accurate and as you might expect. If your actual glucose level is 100 mg/dl (5.6 mmol/l), the meter may report it as 80 or 120 mg/dl (4.4 or 6.7 mmol/l) or anywhere in between, for example. The meters tend to be less accurate at glucose values over 200 mg/dl (11.1 mmol/l). Some devices are definitely more accurate than others. Research the available devices before you acquire one. Outside the U.S., glucose is usually reported in units of mmol/l (millimoles per liter). One mmol/l = 18 mg/dl. To convert mg/dl to mmol/l, divide by 18 or multiply by 0.055.
i have problem with all lab reason no 1-what is the normal range of blood sugar in mmol/l or mg/dl ? every DR tells you different story about normal range for blood sugar. i am a diabete person when i did blood test for hba1c the result it comes 7.2 it tells sametime it is good and sometime it tells me bad. from this point what can learn is how can i trust DR and the lab. Thank you for this information. This really helped put into perspective what numbers I should aim for, since I am not able to keep under 100 all the time, even though I’ve eaten a low carb diet for the last 2 years. Oh and btw I eat high carb, I think high carb gives me a really good blood glucose responds. Also it are good carbs not bad ones like junk and candy. I also eat enough fat, but most of my calories come from carbs. Dr. Bernstein says the powers that be fear hypoglycemia more than hyperglycemic diabetes complications. Thanks for your response Dr. Parker and for all your efforts with your blogs…they are extremely informative and helpful. I did ask my GP about insulin to drive my A1C even lower than its current 5.6. She said that would be very dangerous since I have good control and the danger of hypos is very real. I’ve used the finger prick glucose devices a lot – I had no idea they could be so inaccurate! Thanks for the handy guide to blood glucose numbers – I definitely remember trying to look them up before – good to have them all in one place. antony, compared to not taking that 30-minute walk, the changes seen in blood sugar after walking are seen within a few hours. This doesn’t work for every body, however. I don’t know your health status but if you are non diabetic adult then i can say its abnormal as compared to the ranges Doctor has given and my knowledge about diabetes.You can increase your water intake.That will help you to reduce the sugar through urine. Gina, I wouldn’t depend on increased water intake to lower blood sugar levels. On a related note, I do see many emergency department physicians prescribe intravenous water (actually normal or half-normal saline) to acutely lower blood sugars that are over 400 mg/dl (22 mmol/l). It often seems to work, at least for the short term. I wonder if it’s just a dilutional effect related to increasing blood volume. For example, if you add a half tsp of table sugar to 4 oz of water in a glass, you have a certain concentration of sugar. Add another once of water, and you immediately have a lower sugar concentration. I suggest you check with your personal physician for a diagnosis. I took my blood sugar level before breakfast, the reading was 5.3 . My doctor said that I was pre diabetic. Is she right ? Hi, Alan. Check the diagnostic numbers for prediabetes up above, and you’ll find your answer. A diagnosis usually requires checking at least a couple readings. During the day after eating my blood sugars go up to 12 and 13. But come down slowly. In the morning my reading is around 5. Should I be on tablets? For my American readers, note that 12-13 mmol/l of glucose is about 225 mg/dl, and 5 mmol/l is 90 mg/dal. Nerida, if it were me, I’d want to do something to keep my glucoses under 160 mg/dl (9 mmol/l) or so most of the time. Options include medications, diet, exercise, bariatric surgery, loss of excess weight, others. Granulated sugar alternatives have a higher glycemic load than sugar because of the bulking agent maltodextrin. You may have had reactive hypoglycemia from it by the readings and symptoms. Might be a one off caused hormonally or something you should monitor through diet. Meaning I eat one meal a day at lunch. High fat very low carb. My Blood sugar is ranging from 3.2 – 3.6 Is this okay? I am wondering if I am doing some sort of damage and my end up with Diabetes? I have asked this question on several fb pages and websites and no one can give me an answer. I hoping you can. Thank you very much. I read on the pharmaceutical review that that metformin tablets for diabetes increases your weight, dameges your kidney over time. I am at 6.1 fasting and I am concern about continuing this medication. Can I change my diet and increase exercise to lose weight rather than just consume this pill. I am concerned on the long term damage that metformine does, while I still have a change to go healthy and live normal pre-diabetic. Sadia, it is true that cortisone and other corticosteroid drugs used for asthma (and other conditions) can cause increases in blood sugar above the normal range. The elevated sugars are seen when the drug is in your body, and perhaps a few days thereafter. A short course of steroids does not turn someone into a long-term diabetic. Hi my name is crystal. Just want want to know if my while blood count to normal. Its reading up 4.9 k/UK lu. Pls. Let me know if they that is ok???? So if u can get back to me to I will,. Thanks hope to hear back soon! Thanks again crystal. Hi, Crystal. I’m used to thinking of white blood cells in terms of microLiters or cubic milliliters, and the normal range is about 4,500 to 10,500. Normal ranges easily vary a bit from lab to lab. “k/UK lu” is not the units provided by the labs I use in the U.S.A., so I don’t know the normal WBC count in those units. Hi Crystal, yes that reading is ok, it’s normal I would say and I don’t think you have anything to worry about. Thanks for a very comprehensive and informative post. I mostly love the fact that you offer a conversion for the readings – mg/dl to mmol/l. I have been diagnosed 6 months ago with been diabetic, my doctor prescribed METFORMIN 500MG, for me to take and told me if I feel sick or feel I am having what might seem as side effect’ then I must come back to her and she will try another medication. Of course I refused to take the medication, being a NURSE I have seen the many side if side effects of medication. Diabetes type 2 is reversible so I decided to take my will power back into my hands by dieting and eating all what is suppose to be a healthy choice. I cut out most carbohydrate from my diet, but still eat sweet potatoes, pulses, lentils, beans lots of green vegetables, chicken and mainly steam fish. I decided I do not want to rely on medication for my diabetes. My fasting blood sugar level was 8.7 [157 mg/dl] and now my fasting blood sugar level is between 5.4mmol/L – 5.7mmol/L [97 and 103 mg/dl]. When I am hoping it goes down to the normal level. Please could you tell me if a reading between 5.4mmol/L _5.7mmol/L is high. Cecille, congratulations on your lower fasting sugar levels. I’ve converted your mmol/L readings into mg/dl and added them to your comment above. For young healthy non-diabetics, normal fasting glucose levels are 70–90 mg/dl or 3.89–5.00 mmol/L. All this chat and no mention of Intermittent fasting. Former U-500 Insulin and Metformin user now no diabetes medication for over 1 year last A1c 6.4… 16/8 intermittent fasting and thanks to Dr. Jason Fung’s findings and info on the matter. More Doctors need to be educated about it instead of passing out pills and needles !!!! Can blood sugar be cured or reversed or stabilized in such a way that you stop taking treatment? For type 2 diabetes, yes.